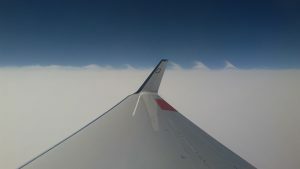 Kelvin-Helmholtz instabilities are waves that usually occur at a shear layer. Shear occurs at a border between fluids (e.g. air or water) that move in parallel motion but with different speeds. This might be the case on a fluid border, e.g. at the ocean surface with wind blowing over it. The Kelvin-Helmholtz instabilities establish as small surface waves on the ocean then. A shear layer can develop within a fluid along a density border. In the atmosphere (but also in the ocean), the instabilities can often be spotted as something like shark fins on a cloud top. This can also be seen from the ground regularly. 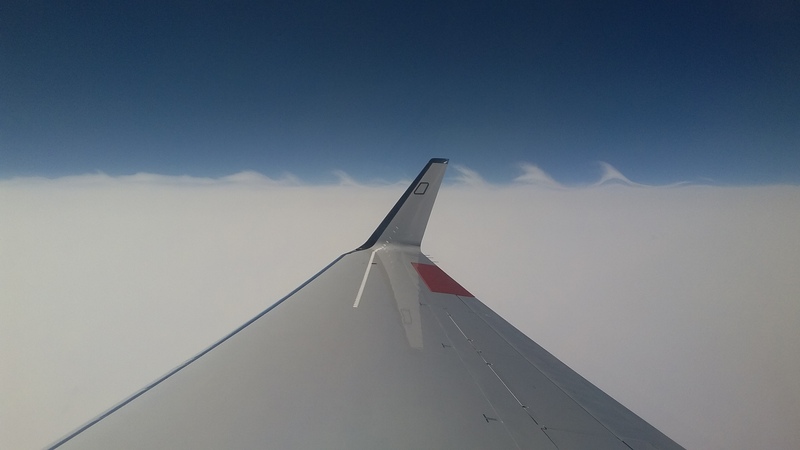 Kelvin-Helmholtz-Instabilities as seen from HALO on yesterdays research flight. Picture by Peter Hoor, Johannes Gutenberg University Mainz. 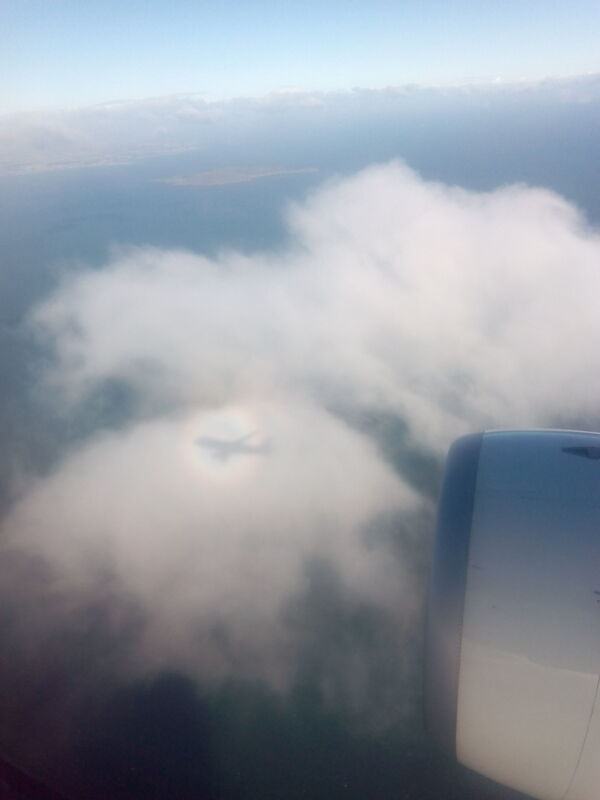 Another beautiful optical phenomenon that can be seen from the air, and also from a mountain or tall buildings, are the glories. This phenomenon consists in a series of colored rings surrounding the shadow of the observer with the red color in the outer part and the blue in the inner, as shown in the picture below. To observe it, it is necessary that the sun is behind the observer and in front, a cloud or fog, all elements aligned, so the glory appears in the antisolar point. The formation of this phenomenon involves the backscatter of the light by individual water droplets. Glory captured from the plane on the way to Ireland. Picture by Irene Bartolome Garcia, Forschungszentrum Juelich.